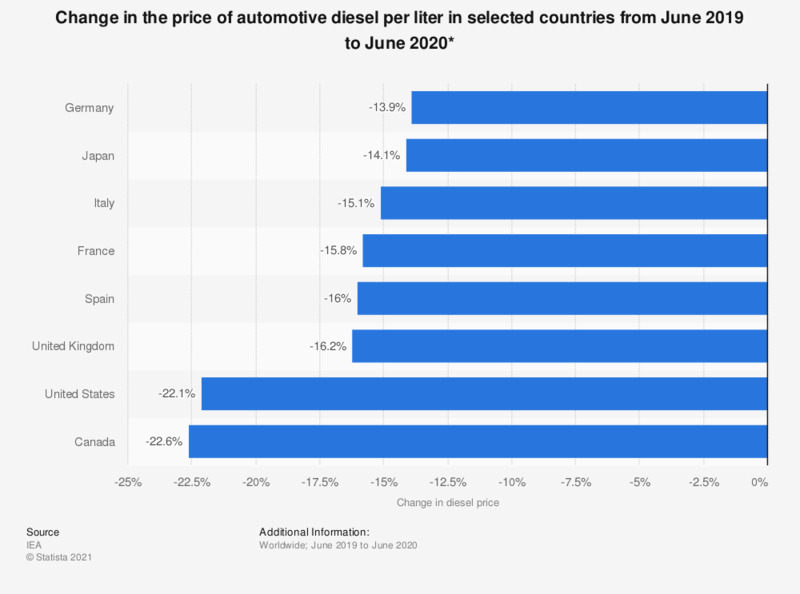 This statistic shows the change in the price of automotive diesel per liter in selected countries for the period between March 2018 and March 2019. The price changes exclude value added taxes from prices for automotive diesel. In March 2019, the diesel price per liter in the United States was some 3 percent higher than it was in March 2018. There are many types of diesel, most commonly a fractional distillate of petroleum fuel oil, all of which are constantly being developed and adapted for the industry. As of 2006, almost all of the petroleum-based diesel fuels in Europe and North America are an ultra-low sulfur diesel (ULSD). Using ULSD will promote more strict emission technologies for diesel engines and lower-emission fuels. Diesel is used for vehicles with diesel engines. Unlike gas engines, diesel engines usually inject diesel directly into the cylinder to continue combustion and thus, move the piston. Due to high compression ratios, diesel engines are often more efficient than conventional gasoline engines. However, diesel can convert into a gel-like substance in colder temperatures, preventing movement through the fuel systems. Diesel has a higher volumetric energy density than conventional gasoline, which is important for fuel efficiency. During colder seasons, the price of diesel tends to rise as demand for heating oil also increases. From March 2015 to 2016, many countries saw a decrease in the price of automotive diesel per liter such as the United States, United Kingdom, and Germany. In the U.S., diesel cars only account for approximately three percent of the car market. In the United Kingdom, however, 37.2 percent of new cars registered in 2015 were diesel. In the European Union as a whole, some 41.2 percent of passenger cars were diesel as of 2015. It is predicted that the number of diesel car models available will triple by 2017 for the American car consumer. * Automotive diesel for non-commercial use. Average end-use prices in national currencies.